"I took advantage of the open days that the different universities organised," he says, "but before the end of my visit to LSBU I had made my mind up that this was the place for me. I was attracted by the location, the structure and most importantly the facilities that would be on offer to me as a student here on the BEng (Hons) Electrical and Electronic Engineering." 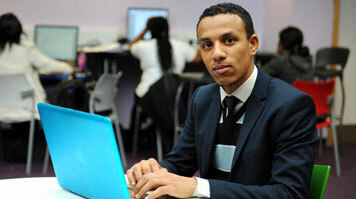 Upon starting his course, Imedouane has found that LSBU lived up to the promise he had felt on that Open Day. "It's been an exciting time for me, both personally and professionally," he says. "I've had the opportunity to learn and develop skills that will not only help me to succeed academically, but will also make me a better professional. The cosmopolitan atmosphere has also been hugely beneficial, and I have met people from all over the world." If LSBU has exceeded Imedouane's expectations, then it is fair to say that London has too. "Living in London is an unforgettable experience," he says. "It is a mix of innovation and heritage, and I love that mixture. The multiculturalism of the city is incredible, and that too has taught me many things." As part of his studies, Imedouane broadened his horizons even further with a year's placement at the University of Bremen, in Germany. "I completed an academic semester there and a 6-month work placement in industry so I have a real international edge to my CV now, which is something I am very proud of," he says. Imedouane thinks that his international experience is complemented perfectly by the course content, giving him a great start to his engineering career. "The course itself has given me the skills I need to navigate in a world of engineering challenges," he says. The world needs engineering solutions from people like me, and I feel well-placed to be able to deliver them thanks to the practical, focused nature of my degree. The specialized nature of the degree is not lost on Imedouane. "LSBU is the only university in London that delivers this course, and that attracts lots of companies who are looking for future engineers with a background in electrical and electronics engineering," he says. "In the future, I hope to work with one of the leading companies in the energy industry, working towards the qualifications I need to become a Chartered Electrical Engineer.